Blake and Chase spent this year’s Free Comic Book Day hanging out with the staff, guests and customers of BSI Comics, and with the microphone rolling all day they got so much good stuff that they can’t pack it all into one episode! 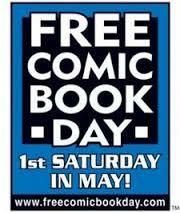 So in part one of our two-part Free Comic Book Day special, the guys chat with the customers and staff about the free books on the table, recent books like DC Universe #0, and the movie that’s on everyone‘s mind, the smash hit Iron Man. Then, the guys talk to members of the 501st Stormtrooper Legion and with Vernon Smith, creator of the all-ages graphic novel series The Adventures of Dexter Breakfast. This entry was posted in Showcase Podcast and tagged 501st Stormtrooper Legion, DC Universe, Dexter Breakfast, Free Comic Book Day, Iron Man, Star Wars, Vernon Smith. Bookmark the permalink.